We've got another special guest this week. Brenna Zedan is the biggest Judge Dredd fan I know here in Portland, Oregon. She does highly unusual things with fingernail art; she blogs about fashion; she does a Tumblr; she's been serializing her story "The Audacity Gambit" online. I always enjoy talking to her, and this week we got to discuss some of the highest-profile Dredd comics ever. DOUGLAS: Before we get into talking about the Batman/Dredd comics themselves, I'd like to sketch out a bit of their history, as far as I've been able to piece it together--and anyone who knows better should please correct me in the comments (or email me). Wagner and Grant's Dredd work (and their work with Cam Kennedy on Outcasts) had impressed DC enough that they were brought on as Batman's co-writers in Detective Comics beginning in late 1987. The Grant/Wagner partnership largely dissolved in early 1988, at least as an ongoing concern, and Grant effectively got custody of Batman; Wagner stopped working on the Detective scripts after five issues or so, but his name stayed on the masthead for seven more. Grant continued to write Batman stories regularly, first in Detective and later in Batman and Shadow of the Bat, for close to a decade. Still, it made a lot of sense to capitalize on the fact that a well-coordinated team had extensive experience writing both one of the most popular American characters and one of the most popular British characters of the time. 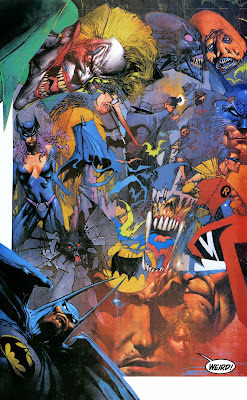 Wagner and Grant eventually came up with the script to Judgment on Gotham, and then Simon Bisley took his sweet time drawing it. According to Thrill-Power Overload, the book was nearly delayed even longer: there had been a corporate decree that there were to be no Batman crossovers published in 1992, the year of the Batman Returns movie. Finally, it got down to the last possible day that Bisley's finished art for the final few pages could arrive to get the book published in 1991; there are legends of a friend of Bisley's keeping him awake around the clock so he could finish the job. The pages arrived by courier from England, Judgment on Gotham went to press, it was a huge hit, and a sequel, Die Laughing, was promptly commissioned. They'd have a whole year to work on it! Die Laughing was a two-parter, and Glenn Fabry, who'd done such an impressive job on a bunch of Slaine sequences, was assigned to render it in the same sort of painted-art style. And then, at some point, it became clear that it was not going to be done very soon, and everybody was waiting for something. So Vendetta in Gotham was commissioned as a stopgap quickie: a one-shot in which Dredd and Batman have an extended fight, alongside a plot involving the Grant/Wagner-created Batman villain the Ventriloquist. (They'd actually created him for some 2000 AD project, according to this interview, probably "The Mean Arena," but used him in their first Detective story instead.) Grant and Wagner's longtime collaborator Cam Kennedy drew it; even if painted art wasn't his thing, he could be counted on to turn work around in a hurry. 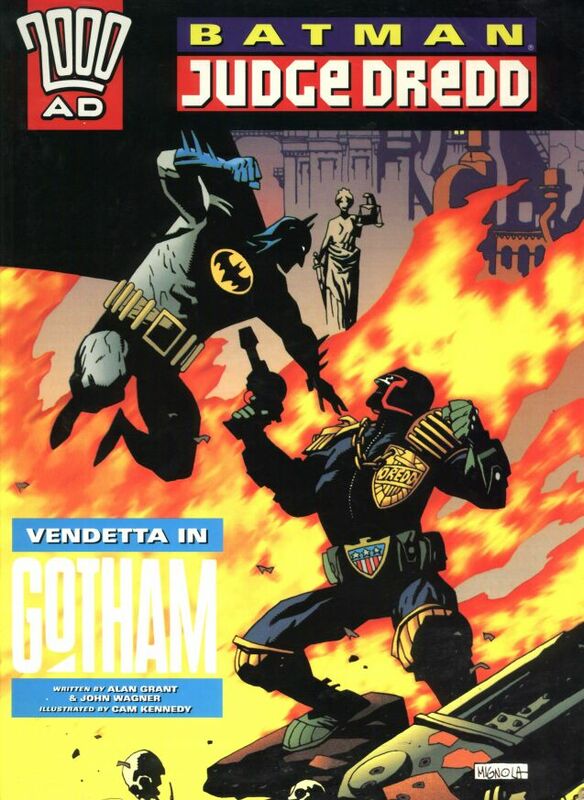 Vendetta appeared in late 1993, with a pretty sweet Mike Mignola cover (above). On its final page, Dredd announces "one of our Psis had a premonition. It seems Mega-City One is going to be needing you!" The concluding caption reads "Judgment 3: Die Laughing will be out next year!" Well... no. 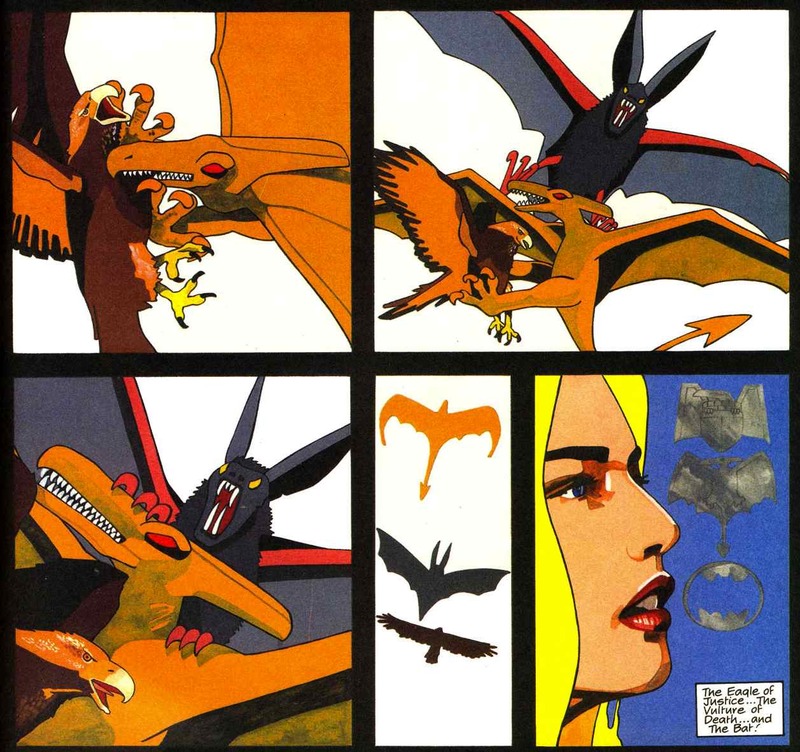 In May, 1994, Judge Dredd Megazine #2.60 concluded Judge Anderson's "Postcards from the Edge" sequence with a story in which Anderson has a vision of an eagle, a bat and a vulture (see below), and realizes she needs to get back from outer space to the Big Meg--another lead-in to Die Laughing. (As Grant put it: "I had to abandon the sci-fi and get [Anderson] back to Earth for a story that didn't actually appear till about 5 years later.") But Glenn Fabry was taking a very, very long time to get it done--he "turned an 8-month job into a 5 year slog," in Grant's words--so there was another fill-in slotted in to keep the project alive: The Ultimate Riddle, with painted art again, initially by Carl Critchlow, with Dermot Power taking over for its final 15 pages. 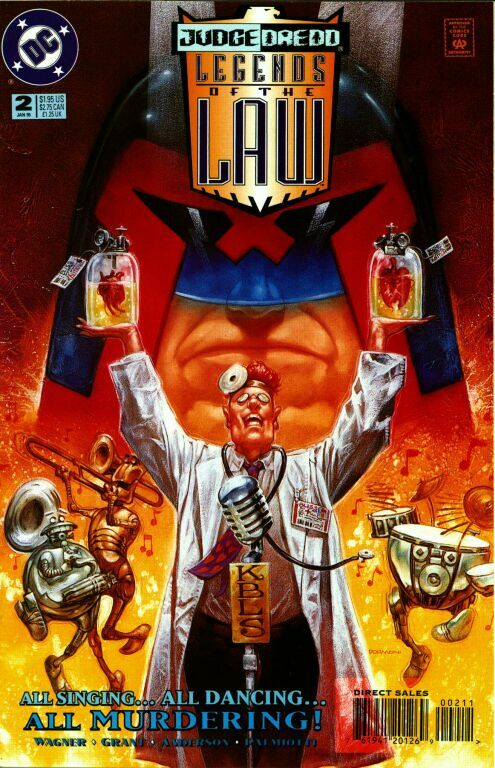 That came out in mid-1995, in time to capitalize on the Judge Dredd movie. And still there was no Die Laughing. After Fabry drifted away from the project, Jim Murray and Jason Brashill finished off the artwork on part 1, and Murray painted the second issue himself. It finally turned up in late 1998. Weirdly, the Batman/Judge Dredd Files collection (from 2004) omits Vendetta, maybe because it's the only episode that's not painted--but that story is referred to in Die Laughing. So that's the backstory. Brenna, how did you first encounter this stuff, and what did you make of it at the time? BRENNA: Oh man, I had no idea that Judgment on Gotham had such an involved history, or that there were more Dredd and Batman books. Why I haven't looked this sort of thing up is beyond me, though it could be because my access to Dredd has always been through luck and chance and if I start finding new things I'm going to want all of them. Dredd in general I stumbled on in an antique store, I was probably looking for Batman, but I picked up a six-issue 2000 AD monthly Eagle reprint buried between dead end Image first issues and 1990s X-Men. A couple months later I'd re-read them a dozen times. I spent about a half hour at that antique store, sorting through all the comics, putting the Eagle Dredd reprints in one box (with a bunch of filler), then offering a flat price for the it. That was—wow, somewhere in 2006, according to my broken image internet memory. 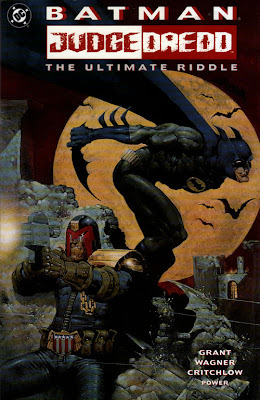 I'm not certain which came first, a poster of the cover art of Judgment on Gotham, which a friend found while dumpster diving, or my partner buying me the book for the holidays. I'd been a Batman fan since I was in kindergarten, though I didn't get a subscription to the main series until I was in high school. I think it just seemed obvious to others that I'd appreciate a pairing of two of the grumpiest vigilantes (one sanctioned, one not), both of which I was a little obsessed over. 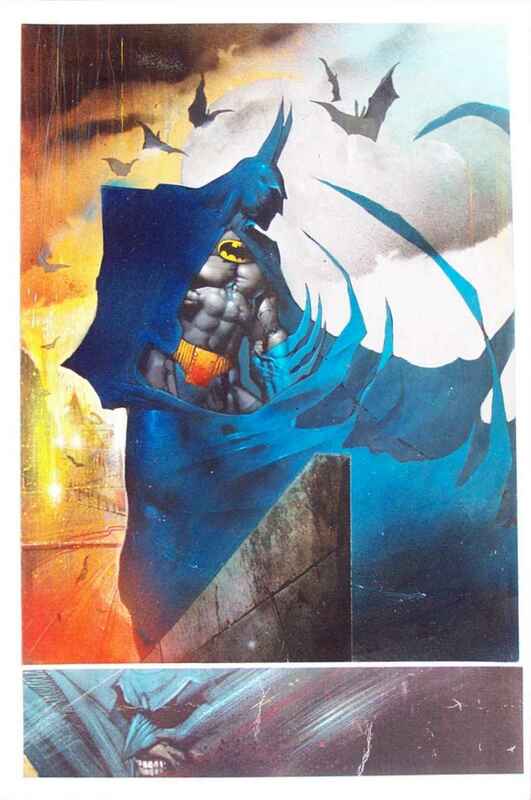 I hadn't really encountered painted comics until Judgment on Gotham, and Bisley's work captivated me. I had the poster framed, and it's been in a prominent place in most of the apartments I've lived in. There's something that, to my untrained eyes, that has something appealingly comics-with-an-"x" or old Heavy Metal-Euro about it. Bisley's perspective combined with the distance of time was terribly refreshing to someone getting steadily tired of what I was seeing in American print comics. How he can take the characters from an airbrushed Coles Phillips to cartoony and creepy is perfect for larger than life, self-important weirdos like Dredd and the Bat. Really, they're a perfect team up, since they both walk the line of seriousness. And then you throw Judge Death in there, who really is a Batman kind of villain. As for Die Laughing, Fabry, Murray and Brashill have a very photo-referenced style that is unsettling. Caricatured faces pasted onto Vallejo bodies is never going to work for me. I suppose I have Murray to thank for giving me the visual of a shirtless Joker, though his work is less off-putting than Fabry's. I adore Judge Death, who just seems to have more fun than the other dark judges, so the first and the last books of this sort-of-series are going to be my favourites. 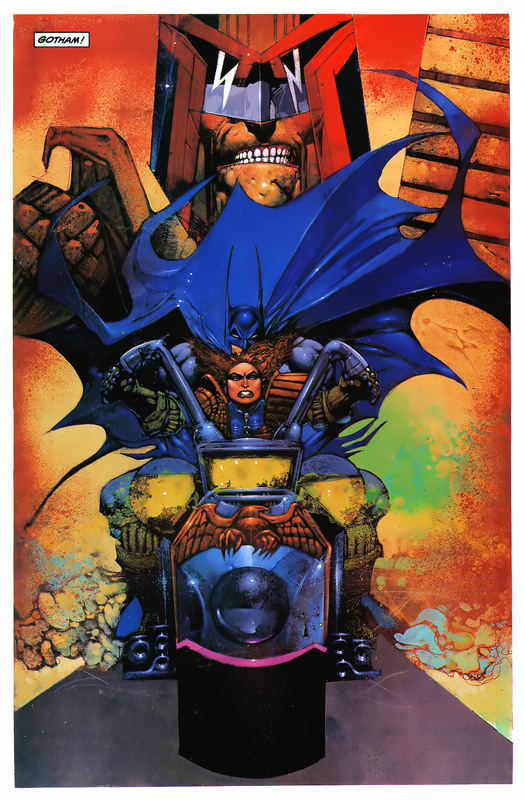 The relationship of Batman and Dredd is, of course, the heart of the series, even if the real driving point was keeping them in the sphere of the other long enough for Die Laughing to come out. These two are sweet together. Which is maybe weird to say. I did just take a minute to see if I could find any Dredd/Batman fanfic, but if it's out there then it didn't float to the top in a quick search. Oh, slash world, you are missing out. They're each the kind of non-cop that the other despises. One is the totality of law, with all the use of brute force that implies. The other supplements the law as he sees fit. Dredd is disgusted by the Bat's vigilante aspect and that he's beholden to no one, Batman finds Dredd's casual manhandling and harsh sentencing of prisoners loathsome. For all the faux-'merica world that the Judge's world is set in, it's a very British world. This is just based on what I've seen in the two arenas of fiction (mostly post-apocalyptic and sf), but British worlds tend to be much harsher. Folks getting killed off is just a part of how things have to be done. Dredd is the product of that kind of mindset. Batman's insistence on not killing and this constant, futile, application of hope for mankind learning or improving is very American. DOUGLAS: A few more brief notes on the writing here. I noticed on a repeat reading of Judgment on Gotham that Wagner and Grant did a very clever thing. They could assume that everyone knew who Batman was, but knew that some of their readers wouldn't know Dredd, so everything from his world is given an introductory gesture: Anderson picking up the phone before it rings, Dredd explaining his authority, Mean Machine giving his standard spiel about his dial. It's also worth mentioning that all of the Batman/Dredd crossovers are firmly in Dredd continuity. 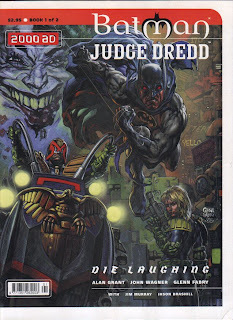 "Die Laughing" kills off Deputy Chief Judge Herriman, and the whereabouts of the Dark Judges at various points in Dredd's series were directly affected by what happens here (there's some later Dredd story where he refers obliquely to that weird guy from Gotham). The Joker can escape from Arkham any number of times, but we always know where Judge Death is. Actually, does anybody happen to know if Alan Grant's Batman stories ever referred, however obliquely, to the Dredd teamups? Yeah, let's talk a bit more about the artwork here. I agree that Bisley's art on Judgment is the most interesting of any of this series--there are just so many little flourishes on every page, from the sliver of Death's mask at the bottom of the opening page to the crazy-quilt compression of the page where Anderson is picking up Batman's history. (Notably, Bisley's credited above Grant and Wagner on some versions of the original front cover.) You've mentioned to me that the original British edition was physically much bigger, and I'd love to see that--Graeme McMillan was talking about that today too. 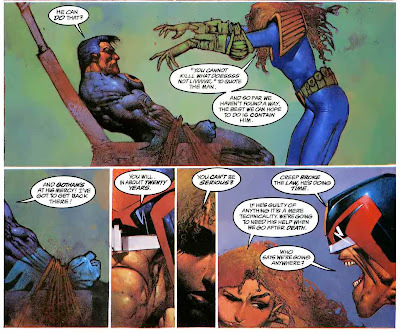 I believe that the era of Judgment was the period where 2000 AD's trim size was the biggest it's ever been, and painted art was the high end of its house styles. There's still occasionally painted art as part of the 2000 AD mix, as with John Burns' work on "Angel Zero" recently, but you don't see it very often. Bisley, more than anyone else, was the guy who was responsible for making the painted look work in British comics, thanks to his work on "Slaíne." It's not often that you see someone who's so invested in grotesquely distorting everything but also in composition, storytelling, keeping visual rhythms clean and varied, and so on. His Mean Machine is crazily asymmetrical--his robot arm's as big as the rest of his body--and we only see more than a fraction of him on panel a few times. His Batman's an amazing compositional device, with a cape taking up whatever space needs to be occupied, and a costume skintight to the point where we can see individual bulging veins; his Dredd is all armor and gear, an immutable shape. Interestingly, one image from this story--the second panel on story page 30, I'm guessing-- showed Dredd's face in Bisley's original pencils. That got nixed. It might be more fun if The Ultimate Riddle looked quick and dirty like Vendetta, but the solemnity of the painted art (would it kill them to use a few more bright tones for contrast? look how well Bisley did it!) makes it seem more serious: if you read it after Judgment, you spend your time looking for the density and play of Bisley's art, and it's not there. It's also a problem that it happens outside both Gotham and Mega-City One--in both characters' series, the setting is a big part of the fun, and a random stone dungeon is a lot less interesting to look at. Quicker to draw, though, and by that point that has to have been a major concern. ("Let's just call it four years" at the end of The Ultimate Riddle has to be a reference to how long the follow-up had already taken.) Also, it's odd that one of the bad guys is named "Xero"; wonder if that overlapped at all with the development of the Xer0 series DC published in 1997-1998? 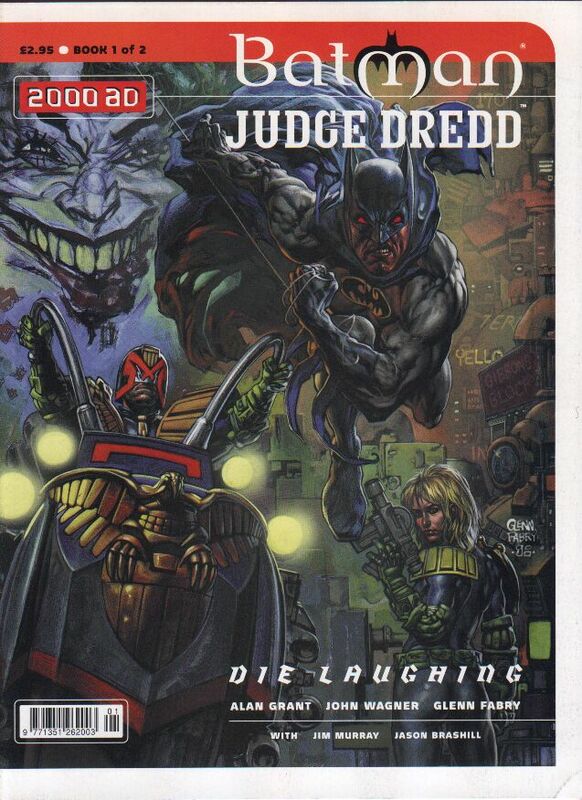 Glenn Fabry's art on the first half of Die Laughing is an improvement, and so's the premise, although this is unequivocally a Dredd story that just happens to have Batman and the Joker in it. (The "Seventh Day Hedonists" routine is not just pure Dredd, it's the sort of thing that would never, ever appear in a Batman story.) Fabry's much less an all-purpose action artist than he is a caricaturist--his characters' face-acting is almost always the star attraction, here as in the Preacher covers he was drawing around that time. But at least in the Batman/Judge Dredd Files book, Fabry's work reproduces very dark, which obscures a lot of the action. That page of the Joker juggling the heads of the Dark Judges should be a killer, but his facial expression is the only part of it that really connects. I don't know if Jim Murray used any CGI or direct photo manipulation for his half of Die Laughing; '97 seems a bit early for that, but it sure looks like it in places (see, for instance, Anderson's face in the final few panels). You're right about "caricatured faces pasted onto Vallejo bodies": the distance between the uncanny-valley shape modeling and the super-goony faces makes nearly every character seem a little off, although the Joker looks okay. (The Joker looks okay no matter how he's drawn.) A lot of the layouts come off as intensely cluttered, too, especially at this small size; it's often unclear how the eye is supposed to travel on the page, which makes it tough going. It's supposed to be showing scenes of chaos, but that doesn't mean the reader's experience has to be chaotic. Brenna, you've got a real eye for clothing and other visual details; tell me more about what you're seeing here! 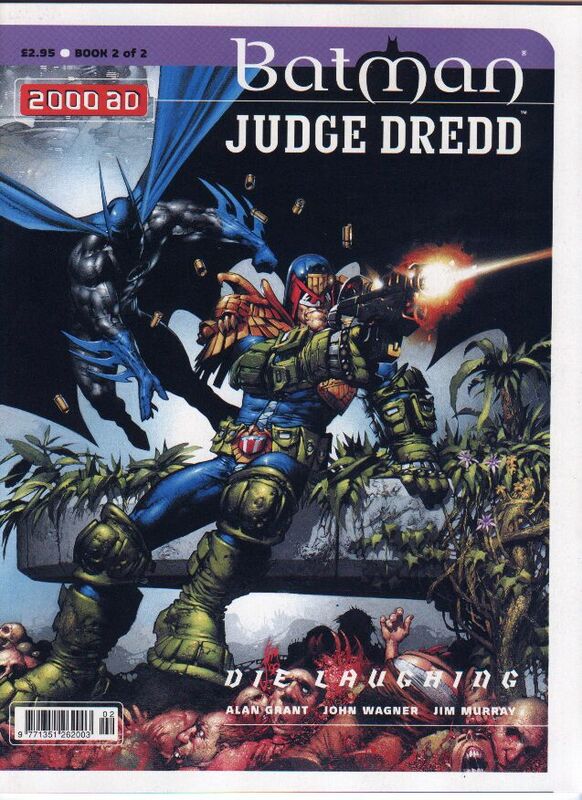 BRENNA: Poor Dredd--I wish he had as big a cultural literacy base as Batman. I didn't know (but assumed, since 2000 AD seems to have themselves pretty together) that the continuity of the crossovers was so solid within the Dredd universe. That makes me super happy. I just got my replacement copy of Judgment on Gotham, since I can't find my original, despite tearing the house apart for it. I was startled at how small it is, just normal US comic size. The original British edition feels almost tabloid-size, too big to properly curl up with, but perfect for diving right into Bisley's work. I think the large format and that they still use painted art are the reasons I pick up 2000 AD floppies when I can. It's luxurious. Hmm, clothing? One of the things I love about older comics is how they hit and miss the clothing and cultural styles of an era. 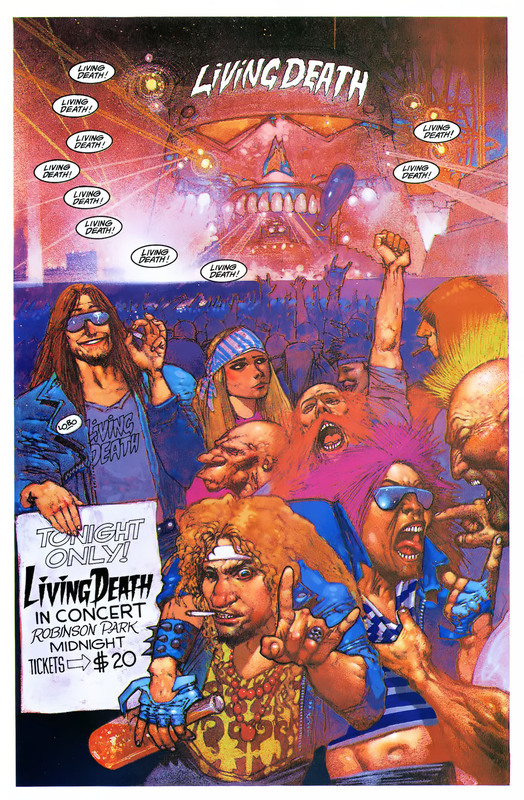 British comics seem to have more fun with it—a part of the whole Dredd universe is skewering that sort of thing, after all—and the crowd attending the 'Living Death' concert in Judgment is almost straight-up Guns n' Roses fans (and my partner points out that, in the late 80s and early 90s, it was pretty common for a band to have a harder name than they lived up to—which makes Judge Death crashing the stage even more beautiful, when you're expecting something a little more Axl). Vendetta and The Ultimate Riddle are both set in such limited arenas, with a minimum of extras, that you don't get any good fashion voyeurism, but Die Laughing is full of it. Oh, except for the wino on page 39 of Vendetta, who looks more like he belongs in Mega-City One instead of boozing on the streets of Gotham. I think that because Die Laughing is set in Dredd's world we get those wonderful visual extras that make these comics for me. Crowd scenes dress any warm body filling the frame with the care of a film costumer, giving the reader details on the world they're plunged into. However I feel about the art in these books, they've got that down. The fade and the toothed earring on the extra in the foreground of page 28 of the first half of Die Laughing is great, but there are some guys in the back wearing perfectly stupid hats that settle the population more steadily into Mega-City One. Overall everyone is sporting that vaguely 1980s-influenced, useless detail (knee pads, that sort of thing) clothing that I think you still see in current issues. But any scantily clad female screams the mid-to-late '90s, like the lady in blue on Die Laughing's first two page spread of carnage in the Pleasure Dome. But whatever fun detail I get out of the later issues, I keep going back to Bisley's layouts in Judgment. Judge Anderson's mocking imitation of Judge Death (complete with spooky zombie hands), Death's disgusted posture at his pieced-together uniform and how his ghost tail coils up when Scarecrow startles him. Other than the sort of weird outline choice for Death's speech bubbles, his is also one of the better applications of sound effects and lettering of the four books (though I keep leaving Vendetta out of my accounting--it's way more solid than I'm giving it credit for, it's a perfect action piece, it just isn't Bisley). I'd guess that has to be a hard balance with painted art, but Mean Machine's “BOK BOK BOK” is only as jarring as the noise itself would be. Are there any other awesome facts about these books? I'm still sort of stunned over their timeline and now also curious about if the Bat ever referenced his fascist cop buddy from another world. There really aren't a lot of other crossovers I can think of that are a significant part of anybody's continuity--that WildC.A.T.s/Aliens one-shot Warren Ellis wrote in the late '90s is the only other big exception I can think of. I'll be getting to two of the other non-2000 AD Dredd crossovers, with Predator and Aliens, later this year; if I recall correctly, Aliens ties in with some ongoing subplots, and Predator is basically one big inconsequential fight scene. There's one other one--a Dredd/Lobo one-shot written by Grant and Wagner--that's never been collected, and you're not missing anything if you haven't seen it. Grant was the writer most closely associated with Lobo for many years, and worked with Bisley on a Lobo miniseries in 1990; "bastich," Lobo's euphemism of choice, ended up in a handful of Grant's Dredd stories, too. 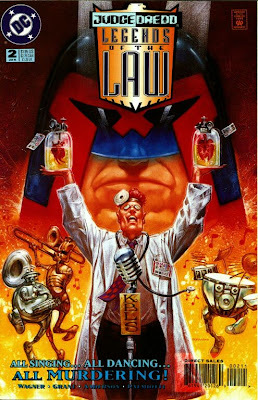 And, although the mid-'90s DC Judge Dredd and Judge Dredd: Legends of the Law series are not quite within the scope of this blog (unless they get reprinted sometime), it's worth mentioning that Grant and Wagner wrote the first four issues of Legends of the Law, and they're a lot of fun. The DC series are officially outside British Dredd continuity, but the Wagner/Grant storyline--a version of how Dredd and Anderson first met--doesn't contradict anything Wagner's established elsewhere. It also involves multiple musical numbers, and a villain who looks like a Don Martin drawing! Beat that. Thanks again to Brenna! Next week, I'm looking at another project involving the principals of Judgment on Gotham, Wagner, Grant and Bisley: the very odd Heavy Metal Dredd. LOL Though I'm a big Dredd fan, I eventually sold the monstrosity that is The Ultimate Riddle. Horrendous. Thanks for all the great posts, Douglas.